Do you need a machete in your survival kit? If you're always out in the wilderness, camping, hiking, climbing and exploring, you likely have a survival kit in your pack. With fire starters, first aid supplies, rope and other essentials, your survival kit can be just as important as your solar powered watch in ensuring yourself a better experience outdoors. One tool that many people are adding to their survival gear is a machete. This long, thin metal blade is somewhere between an ax and a knife with a plethora of uses outside of zombie movies. Many people in the U.S. turn to survival knives as the utility weapon of choice, Swat magazine explained. Machetes can look like jungle cutting tools that are only popular because of how inexpensively and easily they're produced. But Jeff Randall, an experienced survivalist who's spent significant time in the jungle, explained that a machete isn't bad because it's cheap. "Why aren't machetes used more often as primary survival knives? Most of this can be attributed to users thinking the flexibility and thin design make it less of a survival tool and not tough enough for hard use. Another reason is cost. Somewhere it is etched in our minds that the cheaper something is, the less effective it is," Randall wrote in SWAT. Randall calls these negative opinions wrong, explaining that machetes are actually the most effective tools for nearly every use when needing to survive. Thicker fixed-blade knives may have a pry-bar aspect to them, but leverage is rarely required, and a machete can cut, split and slash more easily. Whether you're comparing a machete to a knife or an ax, it wins out for one reason: versatility. The best way to explain a machete's versatility is to point to its wide range of uses, many which can help a casual outdoorsman. Machete Specialists noted trail creation and maintenance as a machete's biggest role. This can help clear out a jungle or improve your path to the fishing creek. Similarly, a machete makes clearing brush, harvesting grain, cutting compost and making a campsite a breeze. When used horizontally with a branch or hammer-like tool, machetes can make splitting wood quick and easy. Survival Creek highlighted some of the most "sustainable" uses for a machete. In addition to clearing and composting, the website explained that machetes can help split fruits and nuts, critical for a survival situation. Also, a machete can be used as a weapon to fend off small animals or find a desperation meal. 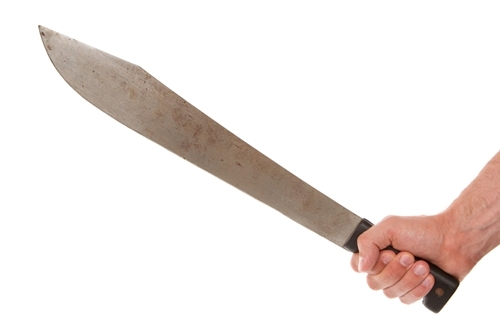 Machetes can be both a hunting weapon as well as a butcher's knife. Additionally, you can use your machete to cut poles and roofs for emergency shelter. Others have even used machetes to cut snow into bricks to build an igloo. Many outdoorsmen and survivalists are big fans of machetes, but that doesn't mean that they're without flaws. The major issue that Off The Grid News pointed to was that a machete can do the job of many other tools, but not as well. A machete can chop, but not as well as an ax. A machete could cut game or fish, but a knife is easier and more precise. Machetes are also larger than hatchets or knives and can be bulky in some situations. If you want one tool that can do a bit of everything in an emergency, choose a machete. If you have the space to bring every tool, you may not want a machete - but what's the harm? Making sure you have a solar powered watch like the PRG270-4 is a key tool for a survival kit. You never know when the batteries may die on your watch which may as well be your compass back to safety. Be prepared for the worst. The PRG270-4 has a wide range of useful features like a compass when venturing out into the wilderness.